Hundreds of “1%” bikers from outlaw motorcycle clubs across Australian, heard the gospel preached loud and clear but lovingly last weekend. They had gathered together peacefully – for the first time ever – in a church in a small seaside village near Geelong, to pay their respects to a great bloke and say goodbye to a mate, known affectionately to most simply as ‘Smithy’. 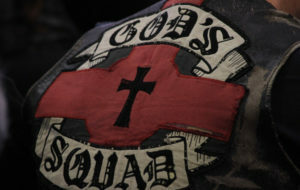 The gathering included patched members of rival outlaw clubs including the Hell’s Angels, the Bandidos, the Gypsy Jokers, the Coffin Cheaters, the Rebels and the Immortals. According to Rev Mark Johnstone, Senior Pastor of The Wave Baptist Church in Ocean Grove, the church was “full to overflowing with more than 1000 people from all walks of life,” on Saturday to celebrate the life and legacy of the Rev Dr John Smith, Founder-in-Chief and International President of God’s Squad Christian Motorcycle Club, a pioneering counter-cultural mission to the marginalised and despised. The gathering included patched members of rival outlaw clubs including the Hell’s Angels, the Bandidos, the Gypsy Jokers, the Coffin Cheaters, the Rebels and the Immortals. Even though many may never have darkened the door of a church or dreamt of being in the same room as their rivals, there was a deep sense of calm and peaceful unity in the air, as hundreds listened to tributes, sang Wesleyan hymns, and were moved by testimonies of missions, local and international. It was clearly a once-in-a-lifetime gathering, unlikely to ever happen again. One of the most moving tributes was given by Sean Stillman, President of God’s Squad UK chapter, who represented members of God’s Squad in 16 countries around the world. He read out a tribute he had prepared for God’s Squad after its Founder died. The U2 singer wrote a piece of prose called “John ‘the Baptist’ Smith,” recounting how when he shared that “some churchy people” thought of him as a heretic. Before he began reading his own tribute, however, he wanted to read a note he’d received from an Irish singer named Bono. The U2 singer wrote a piece of prose called “John ‘the Baptist’ Smith,” recounting how when he shared that “some churchy people” thought of him as a heretic, Smith replied cheekily, “You mean like Jesus, matey?” He also described how Smith viewed the Bible as an “incendiary tract, not some handbook on religion or a sop for mankind’s fear of death but an epic poem about life” which spoke about culture, politics and justice. Aboriginal Christian leader from Queensland, Aunty Jean Phillips, provided the acknowledgement of country and first major tribute. She testified to John’s deep friendship with Aboriginal people across many decades, recalling a story from the 1982 Commonwealth Games in Brisbane, that demonstrated his ‘heart for justice’ and willingness to stand in solidarity with Aboriginal people, even against the authorities and against injustice. Grandchildren and his daughter Kathy spoke of the man they knew as “Daddy” or “Pa,” including one grandson who recalled how Smithy always “went that extra mile, especially for us grandkids”. Steve Drury, who worked with Smith’s ministry between the mid-1980s and mid-1990s, shared how he had witnessed Smith minister to hundreds of thousands of people face-to-face and millions more through media over the 10 years. He said he found Smith “compelling” and “hard to ignore”. He also spoke of Smith’s human rights advocacy work in the Philippines, Central America and Eastern Europe, including several times where Smith had put himself at risk, such as the time he and a colleague were arrested while protesting the demolition of homes by local militia on the Philippine island of Mindanao. Drury said Smith, inspired by the ministry of John Wesley, spent thousands of miles and hours meeting with the poor and marginalised where lived, worked and socialised, “listening and engaging on their own terms.” He said Smith had a “deep understanding of culture” as well as empathy for people, an ability to craft messages and engage people and a love of music. South Australia Uniting Church pastor, Ian Clarkson, spoke early about his first brief encounter with John Smith on a “blistering hot day” when he was passing through South Australia on one of God’s Squad’s first “sorties” through South Australia. He also said there was a great deal of “symbiosis” between John’s ministry and that of one of his heroes, John Wesley, the 18th Century evangelist and pioneer of Methodism. Clarkson went on to preach from Acts chapter 17 and spoke how Jesus as our anchor and forerunner. He recalled asking Smith what he hoped to achieve when speaking to packed lecture halls at large university campuses across the country, with their lecturers standing along the walls. “I want to make their argument bleed,” was his reply. “I just want them to realise that the materialist presuppositions of their professors are flawed and they bleed,” Smith said. Not to be outdone, after all the sermon, the songs and the tributes had died down, as some rose to leave, John Smith appeared on the screen, in full-flight in a 9-min video-clip of him passionately urging those listening to investigate Jesus if they hadn’t and not to give up on Jesus even if they had become cynical about the church. To represent the fact that “the world was indeed his parish”, the family placed Smith’s earthly remains inside a world globe. Following the service, the globe was carried by motorcycle down to Point Lonsdale Pier, where his wife Glena, family and close friends scattered his ashes, with a prayer from Smithy’s dear friend, Brouss Ngunanti Chambers and a traditional Maori blessing was sung.